This printable/downloadable teacher’s guide accompanies NIDA’s Mind Over Matter series. The series is designed to educate teens about the biological effects of drug abuse on the body and brain. Also available for free by calling 1-800-729-6686. 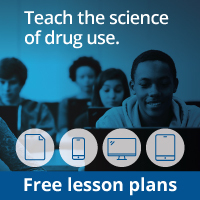 Designed for teens, this site includes information about how different drugs, including marijuana, affect the brain. Also available for free by calling 1-800-729-6686. Heroin. Ferreiro, C. Philadelphia, PA: Chelsea House Publishers, 2003. Part of the “Drugs: The Straight Facts” series. Contains a thorough discussion of heroin, including history, effects, addiction, and related laws. Cocaine. Wagner, H.L. Philadelphia, PA: Chelsea House Publishers, 2003. Part of the “Drugs: The Straight Facts” series. Contains a thorough discussion of cocaine, including history, effects, addiction, and the “business” of cocaine.